Diversified Communications, which owns and operates a 1.5 megawatt solar farm in Brunswick, said on March 8, 2019, that it has bought three energy-related events. 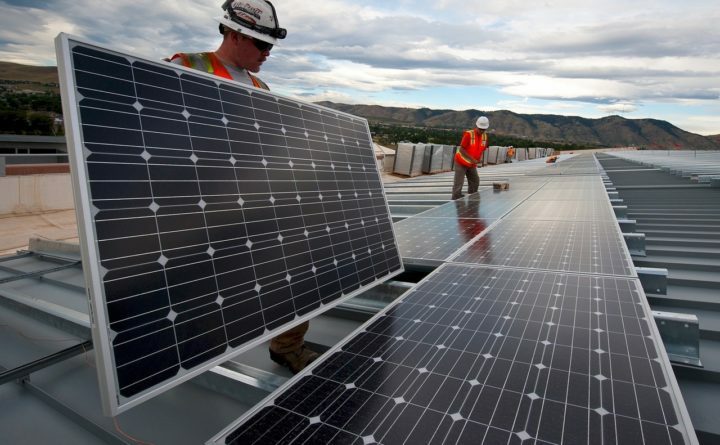 In the photo, workers install a solar panel array in an undisclosed location. Diversified Communications, a Portland company that owns and operates a 1.5 megawatt solar farm in Brunswick, said Friday that it has bought three energy-related events. The deals are for Intersolar, ees (electrical energy storage) and Power2Drive North America. The terms of the purchases, from Germany-based organizers Solar Promotion International and FMMI, were not disclosed. “We’ve been looking to enter the solar market in a significant way for several years and have been watching Intersolar closely due to their successful worldwide footprint and sterling reputation,” Oakley Dyer, Diversified’s corporate vice president of strategy & corporate development, said in a prepared statement. The trade shows embellish the company’s other solar businesses, he said. The 1.5 megawatt solar array went online at Brunswick Landing in December 2017. It is part of the Midcoast Regional Redevelopment Authority’s efforts to generate all of Brunswick Landing’s power onsite, according to Mainebiz. The 4,500-panel array was installed by ReVision Energy. Diversified Communications owns the array and sells power to the MRRA.